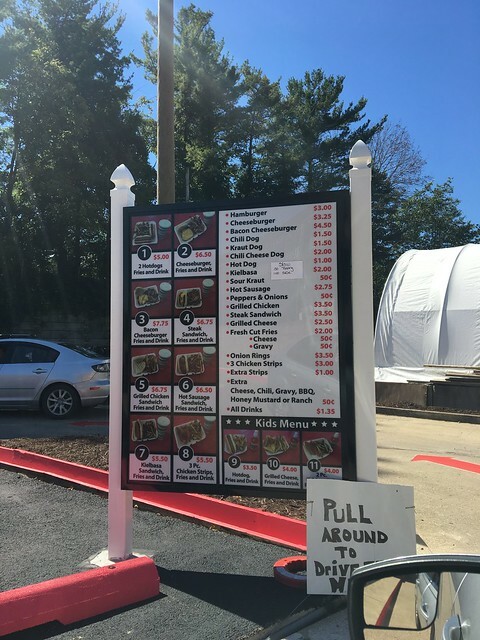 A new hot dog spot opened up at the corner of University Avenue and Patteson Drive. 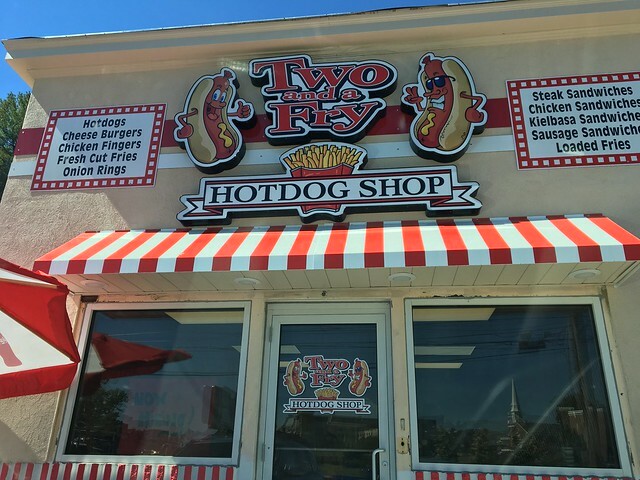 Two and a Fry, which has its primary location in Monongahela, Pa., opened its second location this week and is serving up all things hot dogs, burgers, fries and a few sandwiches. There was some conversation on a local Facebook page about how this building used to be a burger place called "Snaps," and then a Rally's, but those were both before my time. I don't recall there being a restaurant in this space while I've been in Morgantown, but it's been more of a small gambling joint - I think. The good thing about this new restaurant is that it is very visible. That's a high traffic area, so it's prominent. However, because it is a high traffic area, it can be a bit tough to get into and out of. The parking lot is ... odd, and if you go through the drive-thru, you arrive at more parking in the back - but we only found this out via trial and error. So, we walked around to the front and stepped inside. 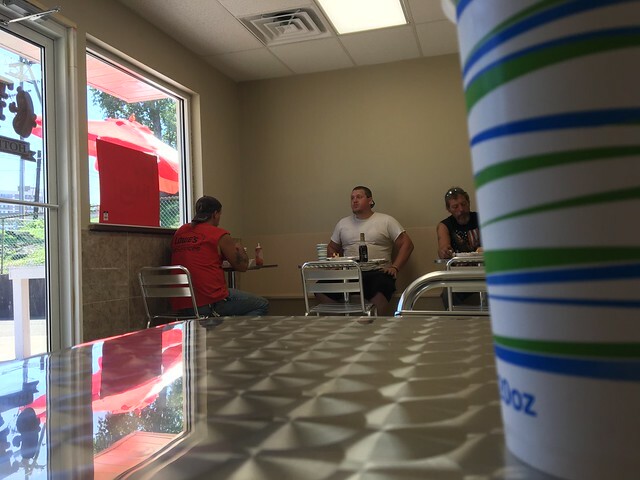 It's a fairly small space, with seating on either side, and the counter to order is at the back. A line of construction workers snaked to the back, and we waited eagerly in line to see if we could use a card here (they do accept cards!). 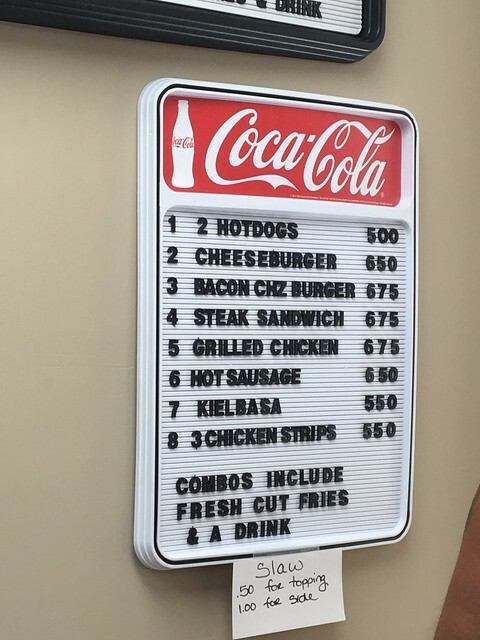 The menu features hot dogs, of course, with a variety of toppings, burgers, kielbasa, hot sausage, chicken, fries and onion rings. 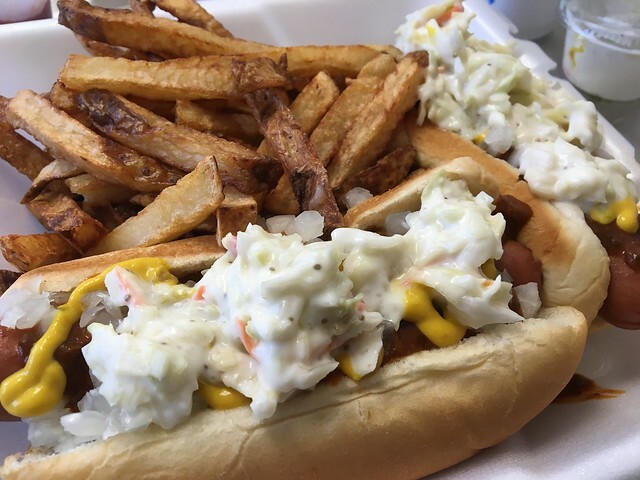 I ordered the top special - two hot dogs, fries and a drink. 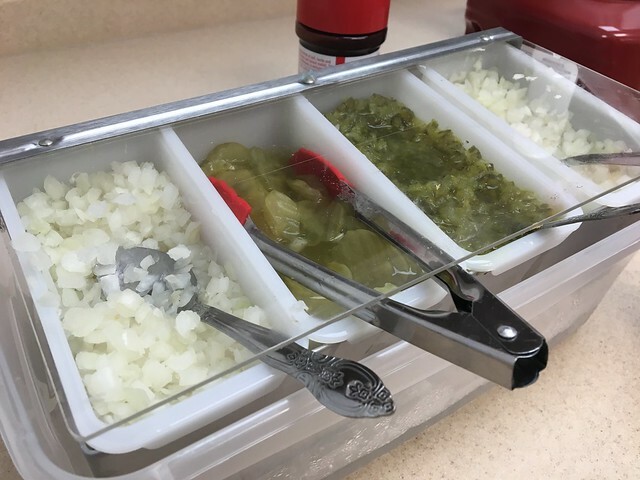 I got chili and slaw on top, because there was a small toppings bar to the side that had onion, relish, mustard and ketchup. I have to admit, the service was a bit of a mess. Granted, they just opened, so that was to be expected. But the poor woman who was running the front of house was also running food, and orders were getting messed up (mine was OK! ), so they're still working out the kinks there. 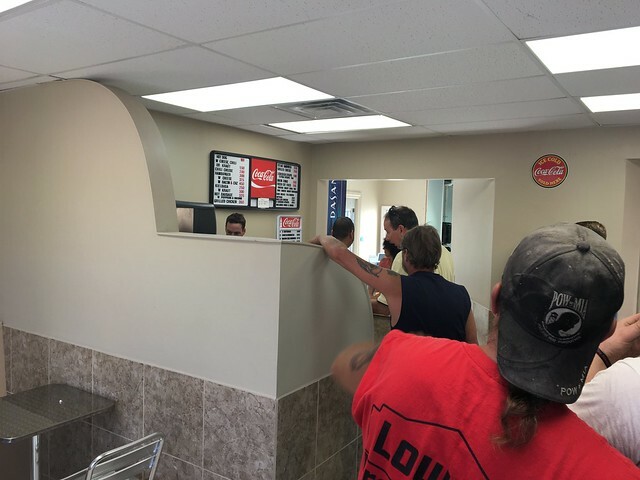 BUT, she was kind to customers despite the chaos. Somehow my total came out to more than $7. I was thinking it would be closer to $5 - even with the upcharge for slaw. Whatevs. I tried to get some ketchup for the fries, but they had run out. I only had a little for my fries. But, I filled my drink and found a seat, and within a minute, my order was out. Very quick despite having a full house. The slaw came as a small container on the side, and I added some onion and mustard to it. I'll be honest in saying it wasn't my favorite type of chili; it had a bit of sort of generic, bland taste. The slaw was a bit tangy and a bit liquidy. Not bad - average. 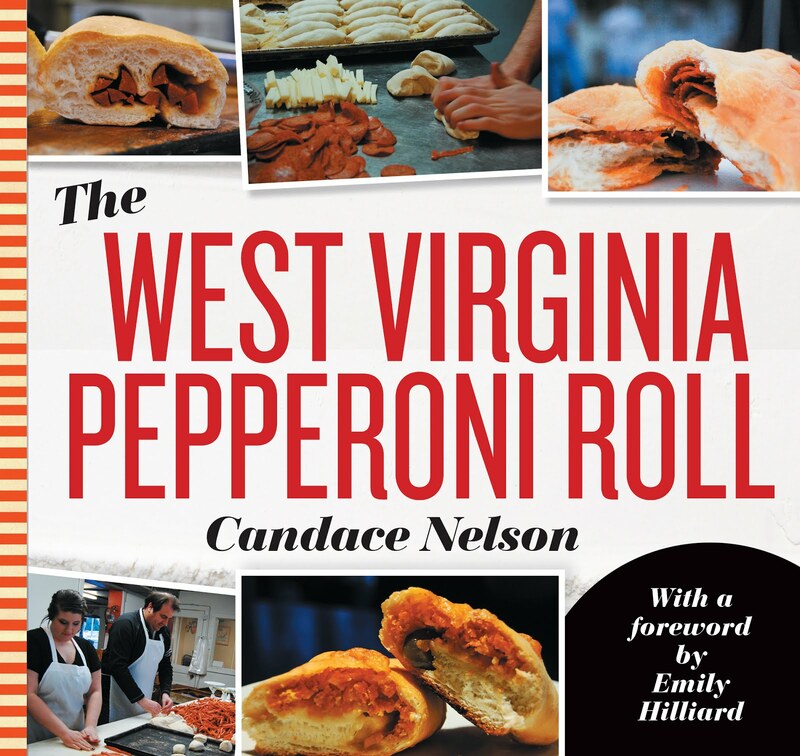 I do love a good boiled hot dog, and the bun was fine - nothing too remarkable. The fries were decent, but crunchier and more seasoning and salt would've made them great. I still think my hot dog crown belongs to Hometown Hot Dogs. 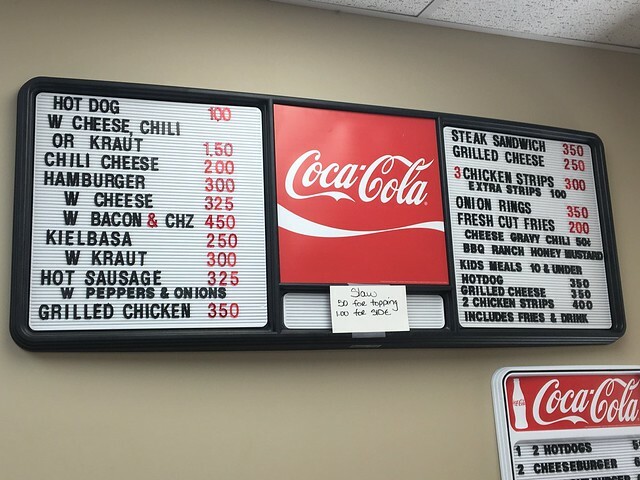 And, I do think there is value in a good hot dog spot. Every so often, it's a nice change to get two dogs with all the fixins. I'll be curious to see how this place does. It seemed to be popular with the folks dining inside, and I do think they are filling a need for it over on that side of town. Getting out was also interesting. We were in the drive thru line to leave until we realized we could go around. Making a left out of this place is likely impossible, but a right was no problem. If you go, let me know your thoughts! And, I'm sure things will grow and evolve as they continue on. I want to give them the benefit of the doubt, as they are so new, and they seem excited. So, I'm excited to see what they have in store for the future.